By 1977–78 New Zealand’s European trade had also been fully containerised with ships such as the unimaginatively named group, ACTs 1–7, of the Associated Container Transportation Company (ACT). ACT 7 was 43,878 tons and an impressive 248.6 metres long. She carried 2,002 containers, 993 of them refrigerated, a very high ratio by world standards. Her high running costs (about $46,000 a day) made longer working days a necessity. 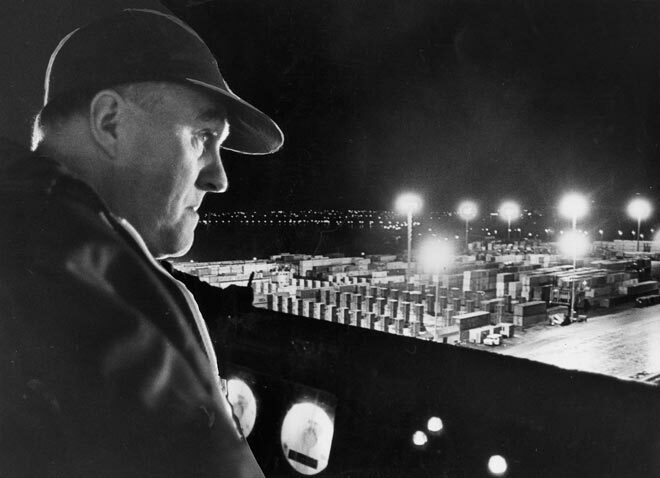 Here, Captain McPhail supervises her departure from Auckland’s floodlit Fergusson container terminal.